Being in the garden this week with Easter activities was especially nice. Taking a look back at last year's photos from April there is no question the garden is much further along THIS April. Probably due to our 'early' freezes in December and then a steady warm-up in February recovery was quicker and earlier. Choosing the best plants for our own specific climate (or micro-climate)becomes even more crucial in these times of unpredictable weather patterns. In my garden I've found I'm leaning more and more towards designing with the endurable characteristics of each plant in mind. 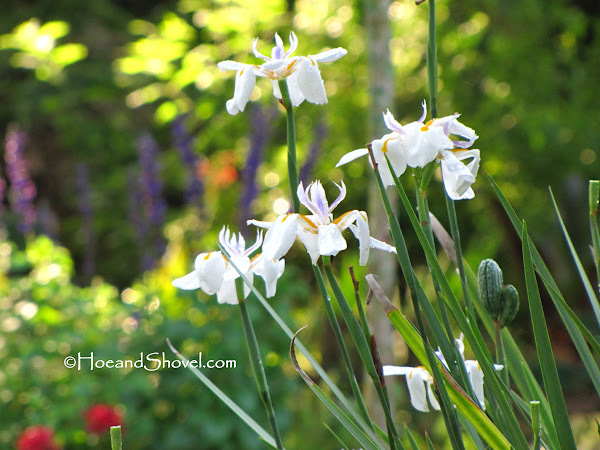 Florida-Friendly Dietes iridioides 'Arican Iris' blooms repeatedly all spring (and sporadically throughout summer)with each rainy day being the encouragement it needs to open a new flush of pristine white flowers. A dapple here and a dapple there of sunshine that shifts and moves around during the course of the day proves to be a challenge for "just the right plants" in "just the right place". But don't be discouraged. In Florida I've found these conditions to be an advantage. Our full spring/summer sun can prove to be brutal on certain plants. 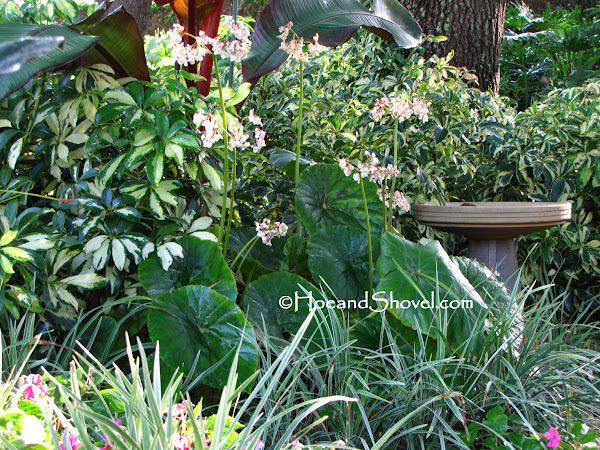 High shifting shade from mature oaks offers a great opportunity for tropicals and Florida-Friendly plants that thrive in humid conditions. Closely observing the specific hour(s) of the day and length of time the sun's rays peek through the branches of trees in each area is invaluable for correct placement. With each season the angle of the sun can also change. Placing containers of favorite combinations on the outer edges of my tropical pathway adds focal points of brightness where 'pockets' of sunshine are adequate for growth. 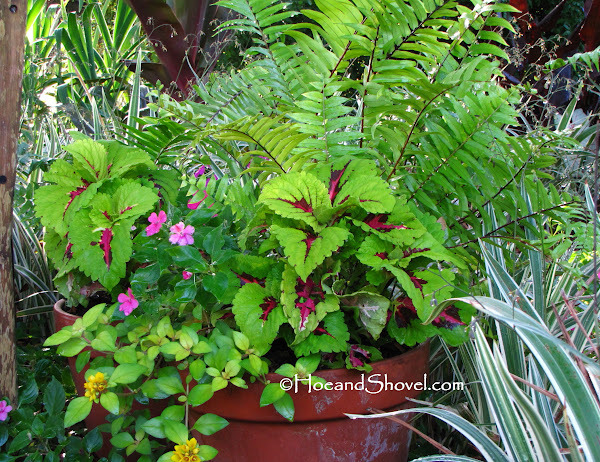 One of the beauties of contained plants is the flexibility they offer to move them around if needed. There are a few 'corners' of my garden that receive a full 4-5 hours of beaming sunlight. In these situations I've purposely chosen to group species of plants that prefer dry, hot sunshine. I view these rare places as an opportunity for plants that otherwise won't do well elsewhere in my shady garden. 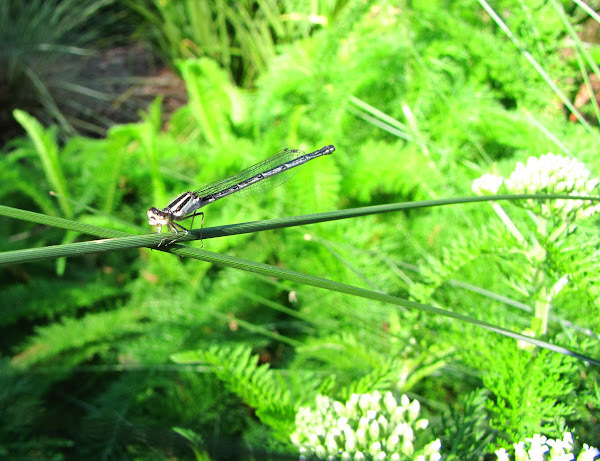 The damsel fly above is resting on a thin blade of purple muhly grass. Muhly grass REQUIRES a goodly amount of sunshine to thrive. Next to it is white yarrow. Its bright green foliage resembles an airy fern. This yarrow (not sure its name) has a much different foliage than Achillea millefolium. After transplanting divisions of it to several partially sunny locations this site next to the street in the front garden seems to make it the happiest. It's blooming! That makes me happy. 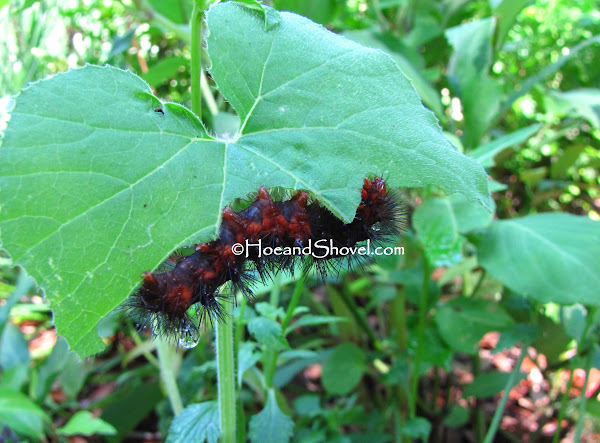 One of the thrilling aspects of healthy gardening that allows predator bugs to eliminate harmful bugs is finding all kinds of new critters that haven't been seen before. I'm thinking this caterpillar is some sort of moth. Anyone know??? The new and exciting compared to the very familiar in an established garden. 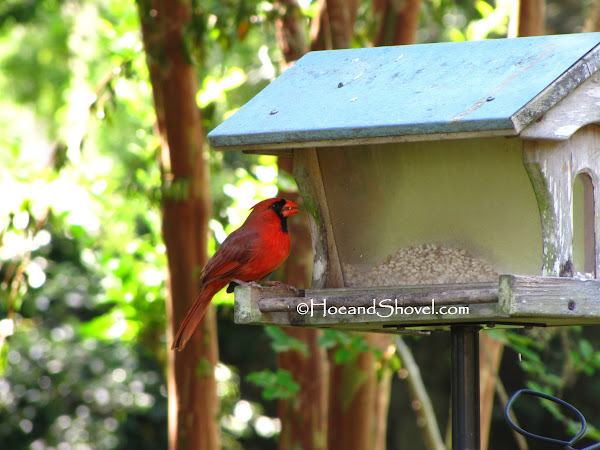 My garden wouldn't be the same without the dozen or so cardinals that freely flit to and fro from morning until night. 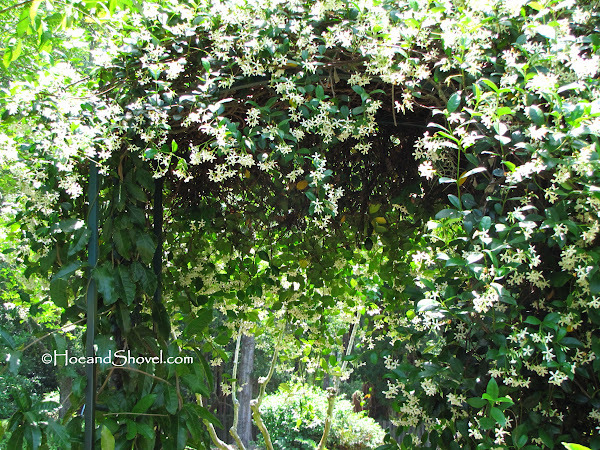 The archway on the perimeter of the circle garden is laden with profuse blooms of Confederate Jasmine. They only last about 6 weeks so I'm savoring drifts from their sweet fragrance daily. 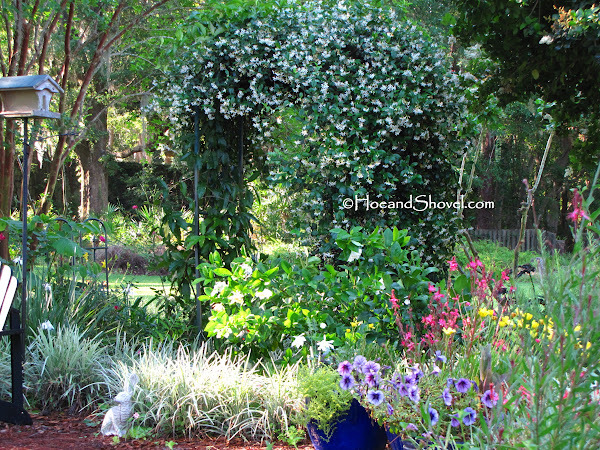 Below the blooming ligustrum and next to the archway is the grafted Miami Supreme Gardenia. A grafted specimen will have better chances to avoid the nematode problems our Florida soils are often rife with. 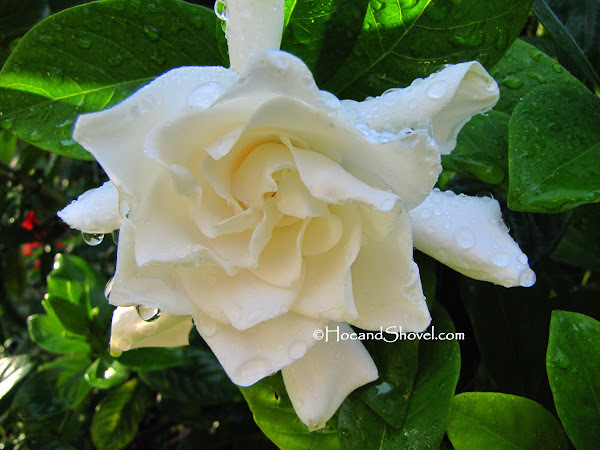 Intensely fragrant flowers of gardenias are a classic symbol of springtime. Creating an inviting environment in our garden contributes to the ease in which we make the most of our outdoor life around here. 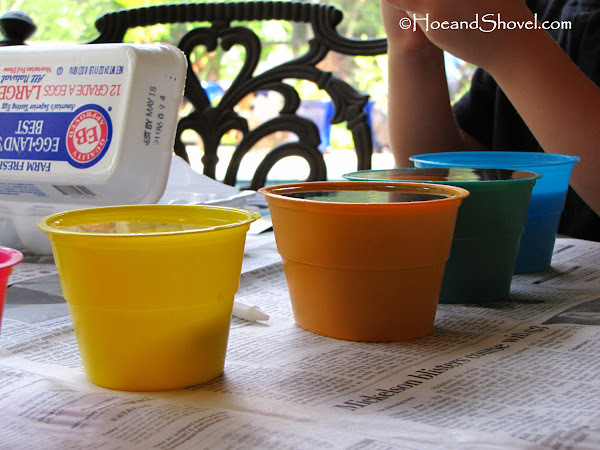 This week we colored eggs on the back lanai with the little ones. And then while playing in the garden the youngest one discovered a newly emerged monarch. 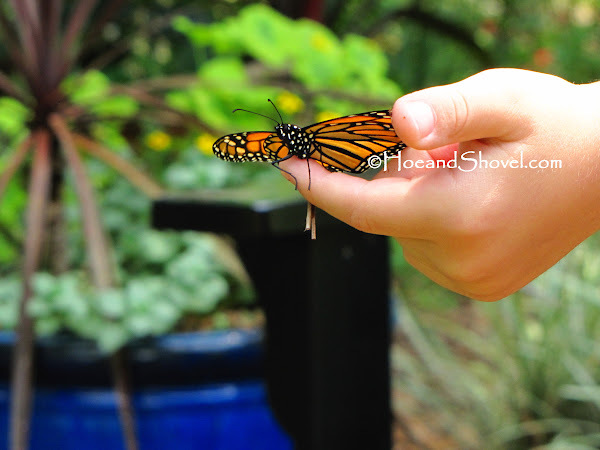 While drying its wings before flight it was willing to sit on our little guy's finger much to his utter delight. 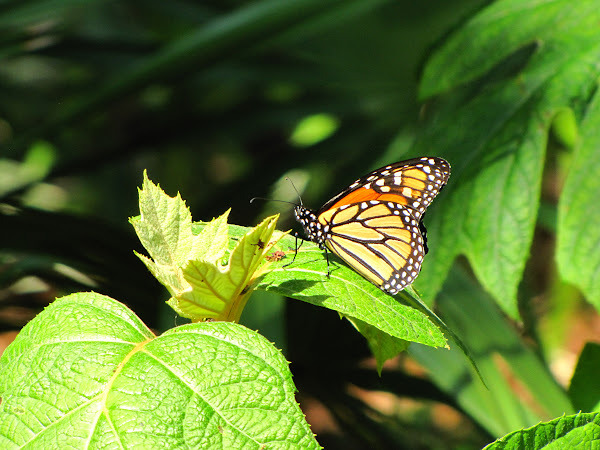 Not the same monarch but another one resting in the dappled sunlight of an Oakleaf hydrangea leaf. 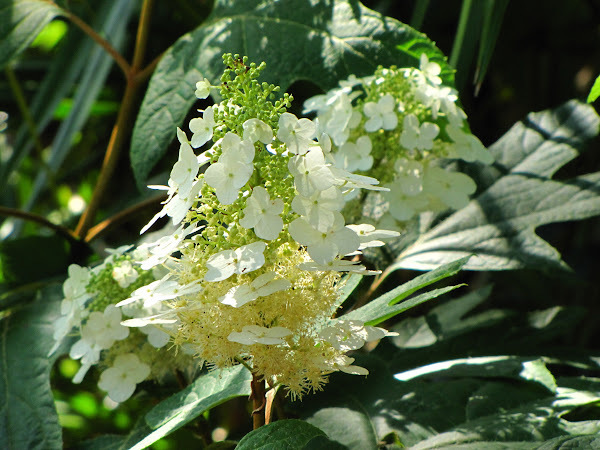 The blooms of the native Oakleaf hydrangea are large and brilliantly white this month. Another shifting-shade-loving plant that requires no additional attention once established. I'm not sure if bromeliads are officially considered Florida-Friendly. But my UN-official determination is they are SUPER Florida-Friendly in my garden. I've been using them as easy-to-care-for container plants since they require very little irrigation and they don't shed messy flower petals. Satisfying the conditions a plant requires will always, in turn, satisfy the gardener. There are many areas of my garden that are nearly self-sufficient after getting fully established. Sure there is weeding, some soft-pruning, and occasional fertilizing. In general, it's remarkable how much easier life in the garden becomes when we master "right plant, right place" in any given area. For more ideas on Florida-Friendly plant choices check out Riverview Flower Farms' plant database and the Florida Yards and Neighborhoods' database. And don't forget to have fun! A most essential ingredient to choosing the right plant for the right place! Meems, your garden is, as always, spectacular! I enjoyed this post and the emphasis on right plant right place, as well as FL Friendly characteristics. The list of plants is quite helpful to me, as I'm starting over again with my new property and quite a bit of dappled light. I wish I could help you identify your caterpillar. Regardless, it's pretty! What a helpful post! I can now go shopping with a print-out from here. You are so right that finding the right plant for each place in a particular garden makes for happier and easier gardening. Your yarrow sure has found its "happy place." I have one bud getting ready to bloom on the ones you gave me. I love the way it is spreading in my sunny rose area. Your April garden is just beautiful. The caterpillar could be a Question Mark. It looks familiar to me. I looked in my _Caterpillars of Eastern North America_ book. I am not positive but that is the closest match. 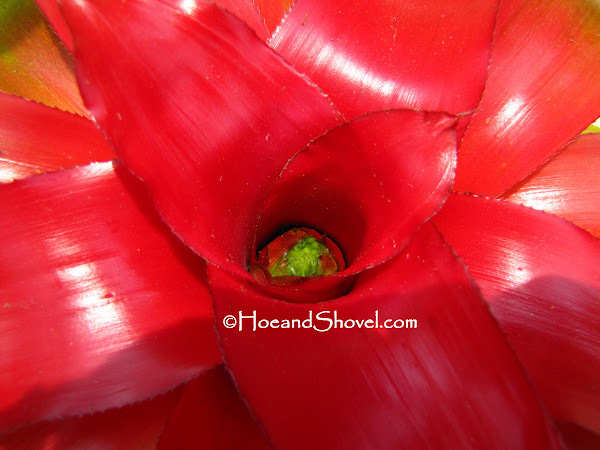 Love those bromeliads. They are so colorful. Have you ever seen a frog in one? I always like to see that picture. Thanks for a great list! 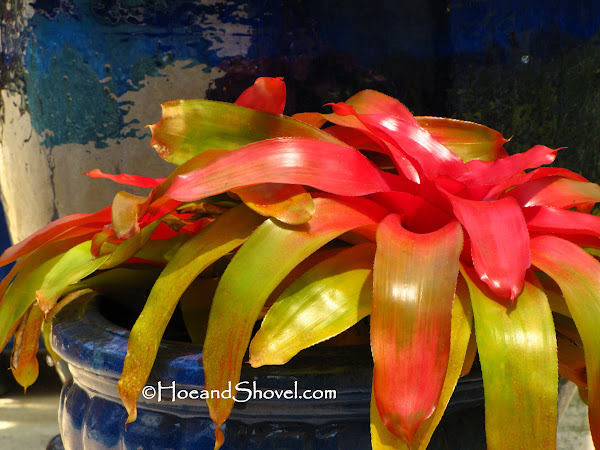 Yes, bromeliad is definitely florida friendly plants. 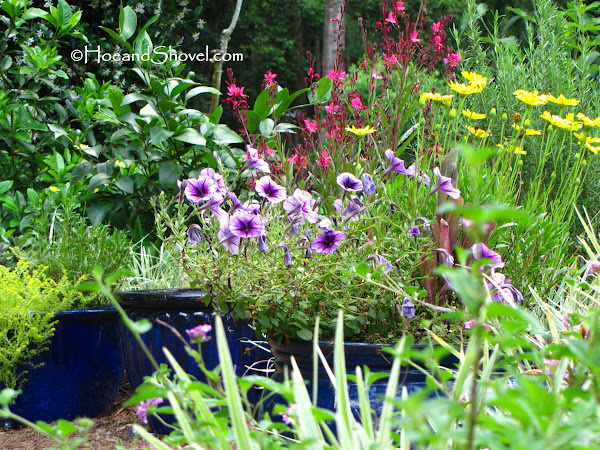 They are so easy and low maintenance, and yet add lots of colors and textures into the garden. What is the plant with tall blue flower scape in the first picture? Beautiful! 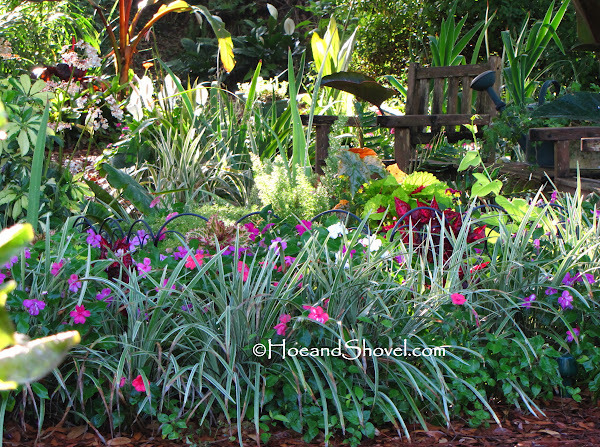 My garden is reinforcement of all you say so eloquently about Florida-Friendly plants. We continue to be amazed at how low-maintenance our new landscape is. Like you, I love my African iris and flax lily and variegated ginger. All have proven to be practically no work at all when planted in the right place. I still rate my beloved bulbine as the toughest of all -- it is so incredibly drought tolerant, tolerates full, blast-furnace summer sun and blooms constantly throughout spring and summer. I look forward to my landscape beds looking as full and lush as yours! I always find new notions to try here. Not all your Florida plants are friendly mid-winter in the edge of Georgia but many are. We're a couple or so weeks behind. Dietes has just put up new foliage. It might want dividing. What a fantastic post Meems. I wish we had more shady areas. We lost a lot of shade losing pine trees to hurricanes and bug damage. Your gardens are just wonderful. Your post is spot on. I am always on the search for that dappled light that you write about. Lots of times during the summer I have to reposition plants into the little shade area that I have here for them to recooperate from the unrelenting intense summer sun. Love all those fabulous colors. We share some of the same plants, but your list inspires me to try some new things (and baby them a little since we are soooo dry here.) Just got some Blackberry Lily in the mail last week and need to plant them - can't wait to see how they do. I agree that the caterpillar is some sort of moth. Love your African Iris pics. I finally bought one awhile ago and it has not started blooming. My walking iris is continually blooming. Thanks for the list of shifting shade plants. I've just about run out of room for shifting shade. Do you have a list for "full afternoon summer sun"? This year I am into Coleus. It is amazing how many different colors and patterns they come in. I am propagating them a lot and sticking them in tiny pockets of shade. Thanks for the latest post...always a pleasure to read. What a lovely, refreshing sight your garden is, Meems. Hope you enjoyed your Easter. My best advice for starting new is 1) amend the soil FIRST 2) plant one area at a time... making each one great. It will keep you from feeling (and looking) scattered. I hope you LOVE your shade choices... I wouldn't be without all the dappled light. It's the BEST. You had better fortune right off with your yarrow. I put some in the edible garden last year and it is also blooming. It really likes hot, dry conditions. Before you know it you'll be dividing it to spread the glory. I am in LOVE with the foliage no matter. The frogs do love to tuck down into broms, bananas, cordylines... they are cute characters. I WISH this was a question mark... have never had one here. I only wish the broms didn't harbor mosquito larvae ... without that one flaw they would be perfect plants! 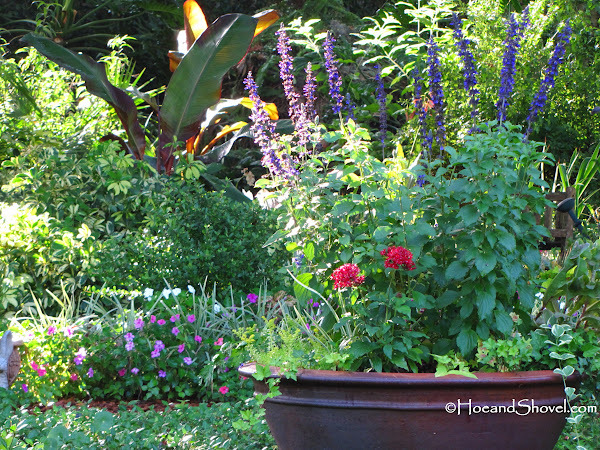 The center garden container has salvia 'mystic spires' as its centerpiece. The bees love it but most of the butterflies pass it by for crimson pentas. All that hard work you two put in last year with your designer HAS to feel good THIS year. If EVER I get to the point where I relax from 'projects' I think I will know what it feels like fully. In the meantime I'm grateful for right plant-right place because it allows me to practically neglect established areas while I'm working on new ones. I agree the bulbine is one remarkable *worker*. I wouldn't use it in my tropical pathway but I did just add it to the newly renovated front lawn area that only gets dappled light. It blooms in either sun or filtered light. Great little *green* plant that requires no extra irrigation when it isn't blooming. It is likely I have 100 African Iris I've divided from only a few starter plants. They do not freeze back here... only multiply on their own. Everytime I hear you say you lost your shade I cringe. You must have missed it terribly at first. But then again you've got lots of beautiful roses that do appreciate all that sun. I don't tire of looking at your garden, Meems. That lushness is something I aspire for. Your sun is even more unrelenting than ours up here in the *north*. :-) I can almost hear the sighs of relief from my shady plants in the midst of summer. I DO love my shade as much as they do. All my blackberry lilies were pass-alongs and they are multiplying on their own. I DO love their erect foliage even when they aren't blooming. Interesting...I JUST purchased a few (bareroot)and planted them last week out of curiosity... wanted to see if they act any differently than the pass-alongs. I actually *bought* that bromeliad at a *sale* a couple of years ago. All I remember them saying was that it was a neo and it wanted to be in the sun. It is in a container on my back lanai and I never even water it. Completely care-free. And yes, what a pop of brilliant color! Oh, I DO love the coleus... especially mixed with caladiums! As you probably know I don't have a full sun area but wish I did for some full on sun lovers. There are many ornamental grasses that work in full sun... firebush, beach sunflower, agastache, salvias, spiderwort, guara, bulbine, gaillardia... the links at the bottom of my post give you options for full sun/trees/shrubs/flowers. You put in what you're looking for and it pulls up options. Thank you. One plant at a time. When I look out at my garden I'm reminded of how barren it once was. It all takes time and patience. Hey Meems...Dappled sunlight is definitely a welcome respite in summer...even for us humans. Your garden is looking great!